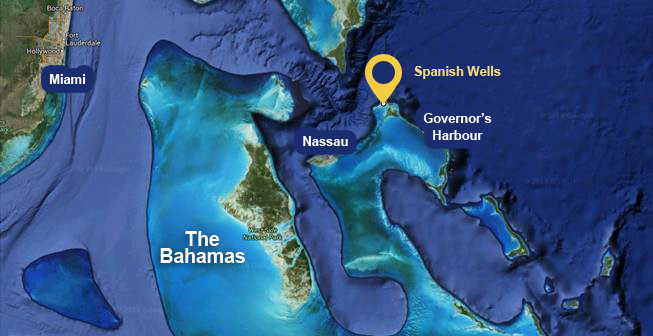 Spanish Wells, one of the family islands of The Bahamas, is located off the northwestern tip of Eleuthera. As the fishing capital of The Bahamas, Spanish Wells is famous for its crawfishing industry and world class deep sea fishing and flats fishing as well as diving, pink sand beaches and crystal blue waters. Spanish Wells is approximately two miles long and a half a mile wide and is joined by a bridge that links it to neighboring Russell Island. To explore the island, golf carts are the transportation of choice and the front desk would be more than happy to arrange a rental during your stay. By Boat: there is a fast ferry that runs from Potters Cay in Nassau directly to Spanish Wells. The journey time is approximately two hours and tickets can be booked online at www.bahamasferries.com. From Nassau: Bahamas Air, Pineapple Air and Southern Air. From Fort Lauderdale: Silver Airways, JetBlue (operated by Silver Airways), and Aztec Airways.